For the most part these are objects that I made for use in one or more of my own scenes. A lot of them have been made available before through Terragen 2 forums or user groups but some are published here for the first time. They are made to Real World scale (One TG2 unit = one metre), most use procedural materials many of which will need to be modified if the objects are scaled. 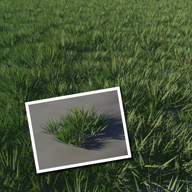 Bitmap textures; if used are included with the object. Some but not all include documentation giving hints on their use. 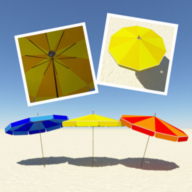 These objects are licensed for personal, non-commercial use only. If you do use them please credit Mr_Lamppost and if possible include a link to where you obtained them. The part about linking to where you got the object is important as there is nothing more annoying than reading that an object was used if there are no clues where to obtain a copy for yourself. In no special order; although that may change as the list grows. 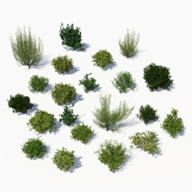 21 generic non species specific bush models in.tgo format ready to use. 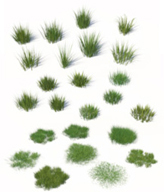 24 grass models; long grass, shorter lush grass and large grass patches. Alien Tree Pack - Glowing Piri balls. Simple stick figure 1.8m tall. 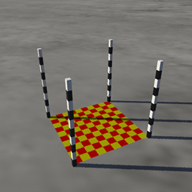 A set of reference grids against which imported objects may be compared. A 1950s style rocket from the classic days of Science Fiction.